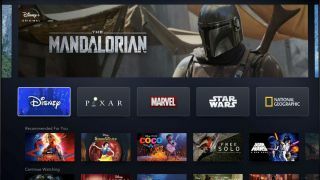 A little Mouse may have told you overnight that a certain Disney+ streaming service is coming in 2019. But that’s just the beginning. Not only are we getting Disney’s incredible back catalogue as part of the deal, we’re also getting MCU shows, Star Wars shows, Captain Marvel on launch, and even every Simpsons episode ever, all for a price that’s cheaper than Netflix. Below, we’ll run you through all you need to know in a little Disney+ cheat sheet so you know exactly what to expect come November. First up, the Disney+ essentials. It’s coming to PC, PS4, Xbox One, Nintendo Switch, and other compatible streaming devices on November 12, 2019. The price is pretty ridiculous, too. At just $6.99 a month (or $70 for an annual subscription), it undercuts Netflix ($13/month) significantly from the get-go. However, Disney itself hasn’t revealed any UK or EU prices, as the Disney+ press release states there are “plans to be in nearly all major regions of the world within the next two years,” but not in November. So, what do you get for your seven bucks a month? Pretty much essential, new MCU chapters for one thing. We already knew about the Loki TV show, the Falcon and The Winter Soldier series, and Vision and Scarlet Witch appearing in their own limited series, but we didn’t know just how important they’d be. Speaking at the investor conference, head of Marvel Studios Kevin Feige says (H/T /Film): “One of the things we’re most excited about is that these will be major storylines set in the MCU with ramifications that will be felt both in the Disney+ shows we’re producing and our features on the big screen.” If you want your full MCU fix, Disney+ is the only place you’re going to get it. Of course, that’s only just the start. There’s going to be an animated MCU series, tentatively titled “What If?” that focuses on the Marvel going down different paths at key junctures. Need an example? The first series will deal with Peggy Carter, not Steve Rogers, becoming Captain America. That’s probably worth the price of admission alone. You can’t forget about Star Wars either. The Mandalorian, the Star Wars: Rogue One prequel (now confirmed to feature K-2SO as per StarWars.com), and a new season of The Clone Wars. And, oh yeah, there’s your expected collection of Disney and Pixar classics, plus every single Simpsons episode ever. Not too shabby, right? Disney+ is going to be on the cutting edge. Check out all the new Disney movies on the way this year that should (eventually) make their way to the streaming service.